1st published game: Wedding, the LARP! After the ridiculous surprise debut of “Wedding, the LARP” at our surprise LARP wedding, we wanted to create it as a published game! To transform it to a publish game I created a new card back of two doves (pigeons) in love. We also went through the cards and depersonalized some of the personas and most importantly we degendered all the cards so that it works for any wedding gay or straight or whatever wedding you’d like to have. 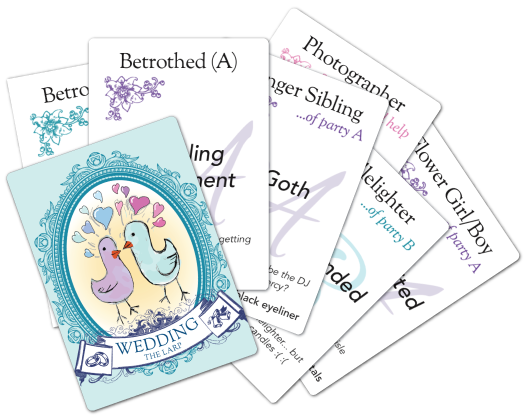 We added several Betrothed cards to choose from so that even the wedding couple can be randomized! For more on the game check out Wedding, the LARP. If you just want to jump on over and buy your own copy of the game at DriveThruCards! You can also download the FREE print and play pdf.